Stromberg Architectural Products, the innovator in glass fiber reinforced concrete, can create plinths that incorporate function and beauty with high-performance. More than just the slab your pedestals rest on, the authentic craftsmanship of Stromberg embodies all you want or need in your plinth design. Showcase your columns, pedestals and statues on a GFRC plinth and remove any doubt that you’ve received the best material for your money. A completely green material, GFRC designs give back. Stromberg combines amazing design and feats of engineering that get your plinths noticed while keeping its commitment to the environment. 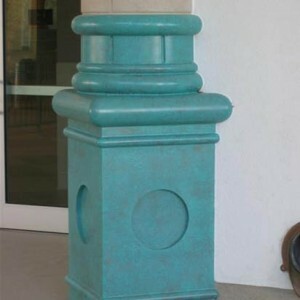 Use GFRC plinths in your hospitality location to support columns or works of art. This sturdy material is resistant to wear and will be around for generations. Stromberg has received international acclaim for their unique detailing and manufacturing of glass fiber reinforced concrete; they’ll tailor your plinth designs to your exact needs. Use GFRC plinths in resorts, hotels, university settings, or any place you want to bring art and architecture together to make a statement. If you want to set off Ionic or Corinthian columns, glass fiber reinforced concrete is the perfect choice. Choose from a wide selection of finishes, textures and colors to match your plinth with surrounding décor and add spectacular detail. GFRC is a composite made from cement, glass fibers, aggregates and polymers. The glass fibers make it an extremely durable material. Glass fiber reinforced concrete is made from minerals and will not burn. It will also shield the materials behind it from the heat of the flame. Stromberg GFRC can be cast in almost any shape or size, so your design possibilities are endless. Stromberg works to create amazing design solutions for their clients. Glass fiber reinforced concrete from Stromberg has so many qualities that make it the perfect choice for your plinths. Lightweight, yet strong, weather resistant, beautiful and fire retardant, it offers you a world of possibilities. Name the color, texture or finish you want for your GFRC plinth; Stromberg can create special decorative patterns and keep it all within your budget. GFRC by Stromberg is much lighter than traditional concrete. Because of this, your shipping costs will be reduced and installation will be quick and easy. If you want design without borders and unmatched customer service, Stromberg Architectural is the place to be. Their vast, innovative and customizable product selection will ensure that your GFRC plinths will meet your demands. Contact them today at 903-454-0904, or email them for a free quote; they will help with your project every step of the way.